One of the observations I made in Alaska is how the traditional Eskimos hunt on the Arctic Ocean. 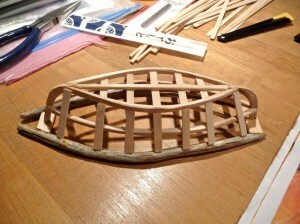 Living on the treeless tundra, they made boats with what materials are available to them. They collect drift wood on the sea shore to make the frame of a boat, then cover the frame with waterproof seal skin and sew them together with strips of skin. They then waterproof the seams with seal fat. Using these seal skin boats, Eskimos venture out to sea and harpoon seals. 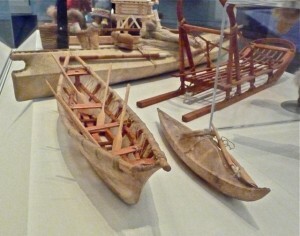 I saw a small models of seal skin boats in a museum. 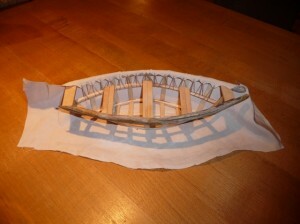 Being retired and having all the time on my hands, I decided to make a model of such a boat at home. 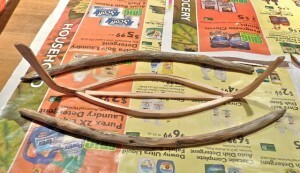 I collected some drift wood on a beach in Montauk, Long Island and shaped them into usable pieces for the frame. 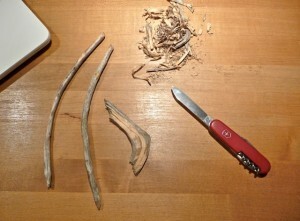 I soaked disposable wooden chopsticks and coffee stirrers in water and bent them over a low flame in the kitchen. Since I didn’t have access to seal skin, I covered the wood frame with a piece of fabric. 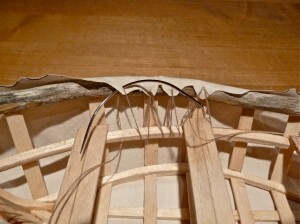 Sewing the fabric in cramped space required a curved needle. 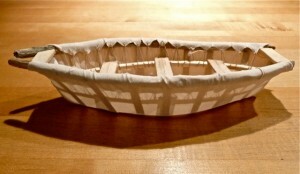 Finished model of seal skin boat. 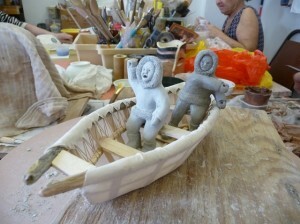 As Sally and I joined the ceramics workshop in a senior center, I decided to make Eskimo figures to occupy the boat. 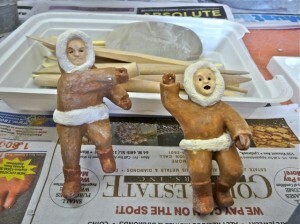 The miniature figures after coloring and firing in a kiln. 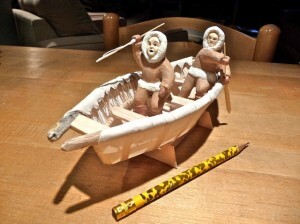 One Eskimo figure looks intent on paddling the boat, and his friend is ready to throw his harpoon at a seal. Job completed. I am ready to make another model. Posted by Robert Wu on Monday, October 25, 2010, at 5:03 pm. Filed under Uncategorized. Follow any responses to this post with its comments RSS feed. You can post a comment or trackback from your blog.